SS-1410-BL-M - Pattyboutik cotton blend Shawl Collar Short Sleeve Button Pleated Detail Blouse. Garment care: machine washable. Model in pictures is 5 feet 8 inches 173cm tall wearing size S. Model in pictures is 5 feet 8 inches 173cm tall wearing size S. Fabric: 35% cotton 65% Polyester. Lengthshoulder to bottom hem S27 inches M27. 5 inches L28. 5 inches XL29 inches. Please choose your size based on bust measurement below. Sleeve lengthshoulder to cuff hem S5 inches M5 inches L5. 5 inches XL5. 5 inches. Bust s33-35 inches m35-37 inches l38-40 inches XL40-42 inches. SS-0864-BK-M - Bust s33-35 inches m35-37 inches l38-40 inches XL40-42 inches. Lengthshoulder to bottom hem S27. 5 inches m28 inches L28. 5 inches XL29 inches. Garment care: machine washable. Sleeve lengthshoulder to cuff hem S7. 5 inches M7. 5 inches l8 inches XL8 inches. Model in pictures is 5 feet 8 inches 173cm tall. Model in pictures is 5 feet 8 inches 173cm tall. Fabric: 70% viscose + 30% Nylon. Pattyboutik unique v neck Shawl Collar Short Sleeve Knit Jumper Blouse Tunic Top. Please choose your size based on bust measurement below. SS-0896-BK-M - Bust s33-35 inches m35-37 inches l38-40 inches XL40-42 inches. Lengthshoulder to bottom hem S27. 5 inches m28 inches L28. 5 inches XL29 inches. Garment care: machine washable. Model in pictures is 5 feet 8 inches 173cm tall. Please choose your size based on bust measurement below. Lengthshoulder to bottom hem S23 inches M24 inches L25 inches XL26 inches. Sleeve lengthshoulder to cuff hem S7. 5 inches M7. 5 inches l8 inches XL8 inches. Model in pictures is 5 feet 8 inches 173cm tall. Fabric: 70% viscose + 30% Nylon. Pattyboutik unique 2-in-1 Pleated White Shirt Short Sleeve Blouse Top. Bust s33-35 inches m35-37 inches l38-40 inches XL40-42 inches. Garment care: machine washable. PattyBoutik Women's 2-in-1 Pleated White Shirt Blouse Black and White M - Sleeve length shoulder to cuff hemS6. 5inches M7inches L7. 5inches XL8inches. Model in pictures is 5 feet 8 inches 173cm tall. Please choose your size based on bust measurement below. SS-0868-BL-M - Model in pictures is 5 feet 8 inches 173cm tall. Sleeve lengthshoulder to cuff hem S7. 5 inches M7. 5 inches l8 inches XL8 inches. Lengthshoulder to bottom hem S23 inches M24 inches L25 inches XL26 inches. Sleeve length shoulder to cuff hemS6. 5inches M7inches L7. 5inches XL8inches. Pattyboutik beautiful Bolero Style Embellished with Buttons Blouse Top. Please choose your size based on bust measurement below. Fabric: body: 94% rayon 6% spandex; Collar: 65% Cotton 35% Polyester. Lengthshoulder to bottom hem s23. 5 inches M24. 5 inches L25. 5 inches XL26. 5 inches. Lengthshoulder to bottom hem S27. 5 inches m28 inches L28. 5 inches XL29 inches. Model in pictures is 5 feet 8 inches 173cm tall. PattyBoutik Women's Bolero Style Embellished with Buttons Blouse Blue M - Please choose your size based on bust measurement below. Garment care: machine washable. SS-1107-CPK-M - Sleeve lengthshoulder to cuff hem S5 inches M5. 5 inches l6 inches XL6 inches. Garment care: machine washable. Fabric: 70% viscose + 30% Nylon. Lengthshoulder to bottom hem S24. 5 inches m25 inches L26 inches XL26. 5 inches. Model in pictures is 5 feet 8 inches 173cm tall wearing size S. Bust s33-35 inches m35-37 inches l38-40 inches XL40-42 inches. Garment care: machine washable. Fabric: 94% rayon 6% Spandex. Bust s33-35 inches m35-37 inches l38-40 inches XL40-42 inches. Please choose your size based on bust measurement below. Model in pictures is 5 feet 8 inches 173cm tall. Please choose your size based on bust measurement below. Fabric: 94% rayon 6% Spandex. PattyBoutik Women's V Neck Twist Knot Front Short Sleeve Top Coral Pink M - Lengthshoulder to bottom hem s23. 5 inches M24. 5 inches L25. 5 inches XL26. 5 inches. Model in pictures is 5 feet 8 inches 173cm tall. LS-1379-PPK-M - Model in pictures is 5 feet 8 inches 173cm tall. Please choose your size based on bust measurement below. Model in pictures is 5 feet 8 inches 173cm tall wearing size S. Bust s33-35 inches m35-37 inches l38-40 inches XL40-42 inches. Please choose your size based on bust measurement below. Fabric: 70% viscose + 30% Nylon. Lengthshoulder to bottom hem S27 inches M27. 5 inches L28. 5 inches XL29 inches. Model in pictures is 5 feet 8 inches 173cm tall. Please choose your size based on bust measurement below. Fabric: 94% rayon 6% Spandex. Model in pictures is 5 feet 8 inches 173cm tall wearing size S. Garment care: machine washable. Sleeve lengthshoulder to cuff hem S7. PattyBoutik Women's Shawl Collar Pleated Detail Blouse Heather Magenta M - 5 inches M7. 5 inches l8 inches XL8 inches. Sleeve length shoulder to cuff hemS6. 5inches M7inches L7. 5inches XL8inches. Lengthshoulder to bottom hem S27. LS-1445-BK-M - Bust s33-35 inches m35-37 inches l38-40 inches XL40-42 inches. Garment care: machine washable. Bust xs31-33 inches s33-35 inches m35-37 inches L38-40 inches XL40-42 inches. Please choose your size based on bust measurement below. Fabric: 94% rayon 6% Spandex. Garment care: machine washable. Lengthshoulder to bottom hem S23 inches M24 inches L25 inches XL26 inches. Lengthshoulder to bottom hem S24. 5 inches m25 inches L26 inches XL26. 5 inches. Sleeve length shoulder to cuff hem xs16. 5 inches S16. 5 inches m17 inches L17. 5 inches XL18 inches. Garment care: machine washable. Please choose your size based on bust measurement below. Fabric: body: 94% rayon 6% spandex; Collar: 65% Cotton 35% Polyester. PattyBoutik Women's Henley Lace Inset 3/4 Bell Sleeve Blouse Black M - Model in pictures is 5 feet 8 inches 173cm tall wearing size S. Bust s33-35 inches m35-37 inches l38-40 inches XL40-42 inches. Pattyboutik pleated Henley Lace Inset 3/4 Bell Sleeve Blouse. Model in pictures is 5 feet 8 inches 173cm tall wearing size S.
SS-0839-BK-M - Bust s33-35 inches m35-37 inches l38-40 inches XL40-42 inches. Model in pictures is 5 feet 8 inches 173cm tall wearing size S. Fabric: 35% cotton 65% Polyester. Garment care: machine washable. Model in pictures is 5 feet 8 inches 173cm tall. Please choose your size based on bust measurement below. Please choose your size based on bust measurement below. Bust xs31-33 inches s33-35 inches m35-37 inches L38-40 inches XL40-42 inches. Bust s33-35 inches m35-37 inches l38-40 inches XL40-42 inches. Garment care: machine washable. Lengthshoulder to bottom hem S24 inches M25 inches L26 inches XL27 inches. Model in pictures is 5 feet 8 inches 173cm tall. Please choose your size based on bust measurement below. PattyBoutik Women's V Neck Short Sleeve Polo Shirt Black M - Please choose your size based on bust measurement below. Garment care: machine washable. V neck short sleeve Casual Blouse Top Polo Shirt. Lengthshoulder to bottom hem S23 inches M24 inches L25 inches XL26 inches. Sleeve lengthshoulder to cuff hem S5. SS-1213-PP-M - Model in pictures is 5 feet 8 inches 173cm tall. Please choose your size based on bust measurement below. Please choose your size based on bust measurement below. Garment care: machine washable. Sleeve lengthshoulder to cuff hem S6 inches M6. 5 inches l7 inches XL7 inches. Fabric: 94% rayon 6% Spandex. Garment care: machine washable. Length shoulder to bottom hem xs26 inches S26 inches M26. 5 inches L27. 5 inches XL28 inches. Sleeve length shoulder to cuff hemS6. 5inches M7inches L7. 5inches XL8inches. Bust s33-35 inches m35-37 inches l38-40 inches XL40-42 inches. Sleeve length shoulder to cuff hem xs16. 5 inches S16. 5 inches m17 inches L17. 5 inches XL18 inches. 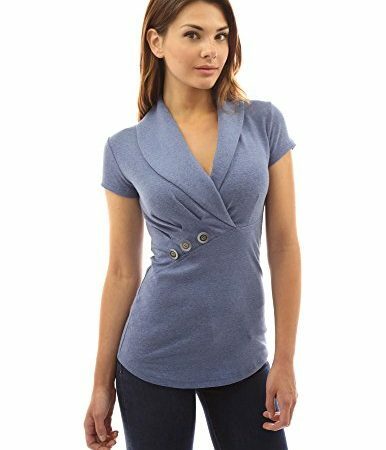 PattyBoutik Women's Notch Neck Buttons Trim Top Heather Purple M - Please choose your size based on bust measurement below. Model in pictures is 5 feet 8 inches 173cm tall. Pattyboutik cotton blend texture Notch Neck Buttons Trim Embellished Short Sleeves Blouse Tee Knit Top. SS-1103-BK-M - Lengthshoulder to bottom hem S23 inches M24 inches L25 inches XL26 inches. Lengthshoulder to bottom hem S24. 5 inches m25 inches L26 inches XL26. 5 inches. Fabric: 70% viscose + 30% Nylon. Fabric: 94% rayon 6% Spandex. Sleeve length shoulder to cuff hemS6. 5inches M7inches L7. 5inches XL8inches. Fabric: 95% rayon 5% spandex; Lace: 100% Cotton. Sleeve lengthshoulder to cuff hem S5 inches M5. 5 inches L5. 5 inches XL6 inches. Garment care: machine washable. Bust s33-35 inches m35-37 inches l38-40 inches XL40-42 inches. Garment care: machine washable. Please choose your size based on bust measurement below. Garment care: hand-wash only. Garment care: machine washable. PattyBoutik Women's Scoop Neck Empire Waist Raglan Top Black M - Bust s33-35 inches m35-37 inches l38-40 inches XL40-42 inches. Bust s33-35 inches m35-37 inches l38-40 inches XL40-42 inches. Please choose your size based on bust measurement below. Garment care: machine washable. SS-0885-LCPK-M - Fabric: 94% rayon 6% Spandex. Bust s33-35 inches m35-37 inches l38-40 inches XL40-42 inches. Bust s33-35 inches m35-37 inches l38-40 inches XL40-42 inches. Please choose your size based on bust measurement below. Fabric: body: 94% rayon 6% spandex; Collar: 65% Cotton 35% Polyester. Sleeve length shoulder to cuff hemS6. 5inches M7inches L7. 5inches XL8inches. Please choose your size based on bust measurement below. Lengthshoulder to bottom hem S24 inches M24. 5 inches L25. 5 inches XL26 inches. Simple cowl neck Short Sleeve Casual Blouse Top. Fabric: 35% cotton 65% Polyester. Model in pictures is 5 feet 8 inches 173cm tall. Please choose your size based on bust measurement below. PattyBoutik Women's Cowl Neck Short Sleeve Top Peach M - Sleeve lengthshoulder to cuff hem S5 inches M5. 5 inches L5. 5 inches XL6 inches. Garment care: machine washable. Model in pictures is 5 feet 8 inches 173cm tall.